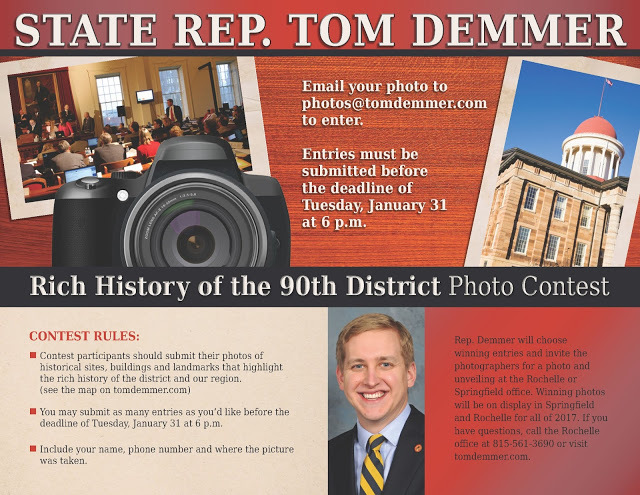 Dixon… State Representative Tom Demmer (R-Dixon) wishes to again bring a piece of the 90th District to Springfield by hosting a photo contest. Participants will be asked to submit a photo that best represents the rich history of the 90th District, in celebration of the inauguration of the 100th General Assembly. The winning photo will be displayed in both of Rep. Demmer’s Springfield and Rochelle offices. “We live in a unique part of Illinois,” said Rep. Demmer. “This contest will allow people to showcase the rich history of our area to others from around the State. I will be displaying the winners of the contest in both my Springfield and Rochelle offices.” The contest runs until Tuesday, January 31 at 6:00 p.m. Participants are asked to submit their photos by email to photos@tomdemmer.com. You may submit as many entries as you’d like before the deadline of Tuesday, January 31 at 6:00 p.m. Include name, phone number and where the picture was taken. Rep. Demmer will choose winning entries and invite the photographers for a photo and unveiling at the Rochelle and Springfield office. Winning photos will be on display in Springfield and Rochelle for all of 2017. Participants seeking more information can call the district office at (815) 561-3690 or visit the website at www.tomdemmer.org.